After what seemed like a very long business trip to the city of Dubai, where the levels of heat reached excruciating points, I was more than excited to spend a low-key weekend in the Scottish capital of Edinburgh. In contrast to the desert heat of the Emirates, the weather in Edinburgh kept cool and crisp at a steady 60-degrees. Thankfully, I packed a light jacket and scarf in my bag to prep myself for the temperature change. Edinburgh was truly a pleasant surprise. Having been to London a few times, and even quickly perusing through the northern city of Manchester, I had an idea of what to expect having never been to Scotland. As it was, Edinburgh was a bustling city full of friendly people, historical and cultural things to see and do, and a plethora of food experiences. “Food experiences in Britain?” you might be asking yourself. Well, yes. In fact, in the past few years, the food culture across the pond has been evolving immensely. Everything from Britain-ized Indian fare (like kedgeree) to a cultural resurgence of classic English dishes (Scotch eggs, Welsh rarebit, and steak and ale pie), and French favorites to even American standards – the culinary landscape of Great Britain has become a definite draw for locals and tourists alike. And with gastronomic super stars like Gordon Ramsay and Marco Pierre White captivating audiences around the globe, there’s no wonder why many eyes (and palates, perhaps) are fixated on the ever-evolving food scene of Britain. In Edinburgh alone there are five Michelin starred restaurants, which is truly a nod to the culinary excellence that abounds in the area. But even without the coveted star ratings, there are countless great restaurants that dot the Scottish capital. One restaurant, in particular, is Galvin Brasserie de Luxe –one of the restaurants at the Waldorf Astoria Edinburgh – The Caledonian. The Brasserie belongs to the chef brothers, Chris and Jeff Galvin. Both from Essex, the brothers have careers that collectively span across both sides of the Atlantic. And with a list of restaurants in Britain, and their own Michelin stars to boot, the brothers operate two restaurants in Edinburgh, both at the Waldorf Astoria hotel. Galvin Brasserie de Luxe is the more casual of the two, and presents French brasserie classics along the busy Princes Street corridor in the city center. At the helm of the brasserie’s kitchen is Executive Chef Fraser Allan. Despite my limited time in the city, I made a lunch reservation at the Brasserie to experience it for myself. And as expected, I had a great time. Just inside The Caledonian, or “The Caley” as it is called by locals, the brasserie was bustling for Sunday brunch, with hotel guests and locals alike enjoying anything and everything from the a la carte menu to specials like the weekly “Traditional Sunday Roast.” In fact, the table next to me partook in the roast, which looked like a fantastic experience. But as I was counting my calories that day (after a week of endless eating and drinking in Dubai), I opted for a much more figure-friendly seasonal menu –also a special that is offered throughout the year. 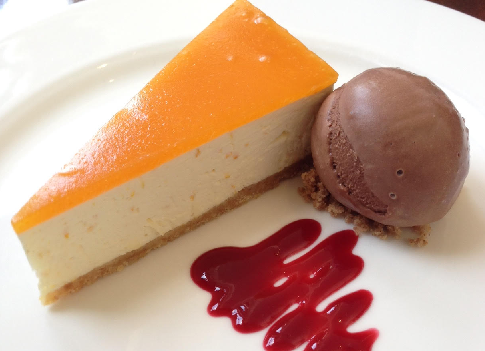 For only £19.50, guests can enjoy a three-course meal at lunch or dinner. 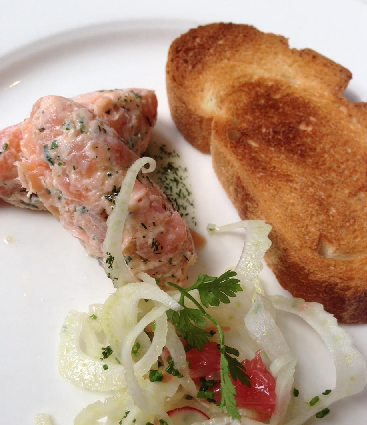 My first course was a delicate dish of salmon rillettes served alongside a lightly dressed radish and fennel salad & a crostino. With the salmon having only a hint of smokiness, the fresh texture and flavor paired nicely with the toasted crostino. And while I tend to shy away from fennel, the salad proved to be much milder in taste than I expected, and offered a refreshing contrast to the full-texture of the rillettes… a delicious start. 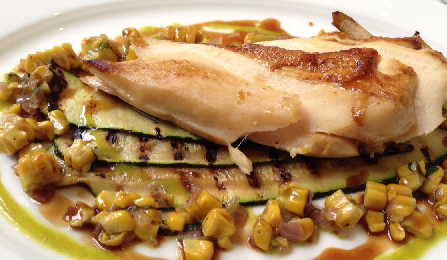 Next came my main course –which was a very safe corn-fed chicken breast “dressed” with grilled corn, basil and courgette. As safe as it was, it was also extremely tasty. I sometimes find chicken breast to be completely too dry or not flavorful enough at restaurants. But here the dish was perfectly cooked and seasoned, with its natural juices enhancing the course all around. And thankfully, I didn’t feel completely full afterward, which is always a nice feeling. So the final course may not have been exactly “figure friendly,” but it was delicious nonetheless. The apricot cheesecake was light, and the contrast between the sweetness of the apricot and the slight grittiness of the cake’s crust was its highlight. The slice of cheesecake was served with a raspberry drizzle and a scoop of Valrhona chocolate ice cream. Valrhona chocolate is one of the most delicate-tasting chocolates to come out of France, and it paired nicely with the cheesecake. It was easily a perfect end to a suitably filling lunch. The restaurant itself is reminiscent of a traditional brasserie –with black and white tiled floors, wooden tables and chairs, and no tablecloths –it is a welcoming, casual place where guests can enjoy a semi-formal meal, or something more low-key. The room was filled with friends and families celebrating birthdays, anniversaries, early father’s day lunches, and even your typical Sunday brunch. The setting was lively, and the service was extremely pleasant and careful. 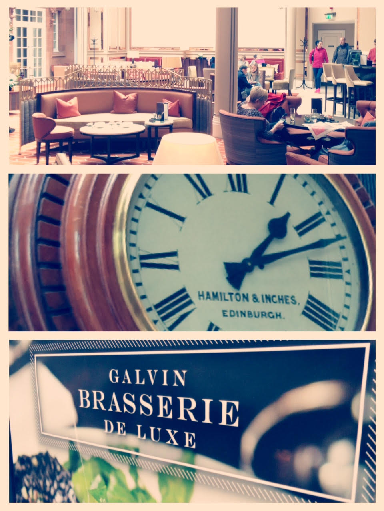 I truly cannot wait to visit Edinburgh again, and there is no doubt that I would swing through Galvin Brasserie de Luxe again, too. The restaurant was presented with a Michelin Bib Gourmand in 2013, which recognizes the restaurant’s potential. It is classic, but at a value that does not compromise in style, flavor or service.